As production continues on Deadpool 2 in Vancouver, we've seen a new Deadpool 2 video that shows Zazie Beetz's Domino leaping from a freeway overpass into a giant inflatable panda bear. While it may certainly be hard to top that footage, more photos have surfaced from Vancouver indicating an organization from the comics known as the Mutant Response Division. And it looks like they have a strong presence in this sequel. As of now, though, there is no confirmation that the MRD will show up. But when they do, they'll going by a different name. Twitter user Animal Desatado noticed new photos from the Vancouver set, one of which features a soldier wearing a grey military or law enforcement uniform with the initials DMC on the armband, which is also featured on the large truck behind him. Animal Desatado noticed that these uniforms are quite similar to the Mutant Response Division, even though the organization in the movie clearly has a different name, which is speculated to be Division of Mutant Containment. There is also another photo featuring a sign for the DMC "Transfer Division," but what's also interesting is that at the bottom of the sign, it reads that this is, "Property of the United States Mutant Division." It has already been confirmed there will be no major X-Men cameos in this sequel, so this could be another way to bring in different elements from the Marvel comics besides the X-Men. It's possible that these photos could tie into Cable, since, in the comics, Cable originally came from a future that wasn't exactly mutant-friendly. While there has been no direct indication that there will be any time-travelling scenes in Deapool 2 yet, there isn't much revealed about the story as a whole, so it certainly could be possible that these scenes are set in this bleak future. The first photo of the DMC soldier is paired with a side-by-side shot of a MRD soldier from the comics, and as you can see, the similarities are quite uncanny. The Mutant Response Division was created for the animated series Wolverine & the X-Men, which only ran for one season between 2008 and 2009, centering on a war between these mutants and the U.S. government. 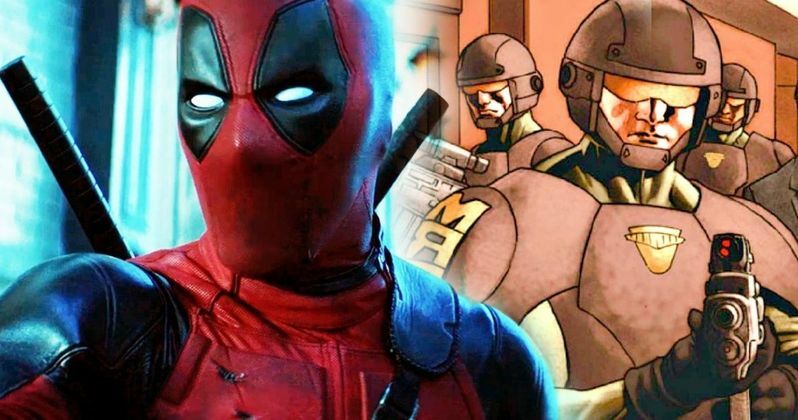 Since then, the MRD has transitioned to the Marvel Comics, and if this is really the MRD, Deadpool 2 will mark the first time this institution will have a presence in a big-screen Marvel movie. Still, as of now, there isn't much that has been confirmed about Deadpool 2, aside from the cast led by Ryan Reynolds (Deadpool), Josh Brolin (Cable), T.J. Miller (Weasel), Morena Baccarin (Vanessa Carlyle), Leslie Uggams (Blind Al), Karan Soni (Dopinder) and newcomers Zazie Beetz as Domino and Jack Kesy, Julian Dennison and Shioli Kutsuna in unknown roles. The production is still reeling from the on-set accident that killed stuntwoman Joi Harris, who lost control of her motorcycle and crashed into a plate-glass window, in her first movie as a stunt rider. The latest we've heard on this sequel is that crew members warned the filmmakers that an accident like this could happen, with Joi Harris, a professional motorcycle racer, reportedly not given enough training for the stunt, which had to be done on that date. 20th Century Fox has issued a June 1, 2018 release date for Deadpool 2, and while we wait for more updates on this superhero sequel, check out the latest set photos below.